I've been experimenting with DLTCEP recently and decided to take a stab at creating a Staff of Withering from the 1e and 2e DM guides. I managed to get all of the effects and icons I wanted in place (through lots of trial-and-error, of course) and it seems to works perfectly in BGEE. 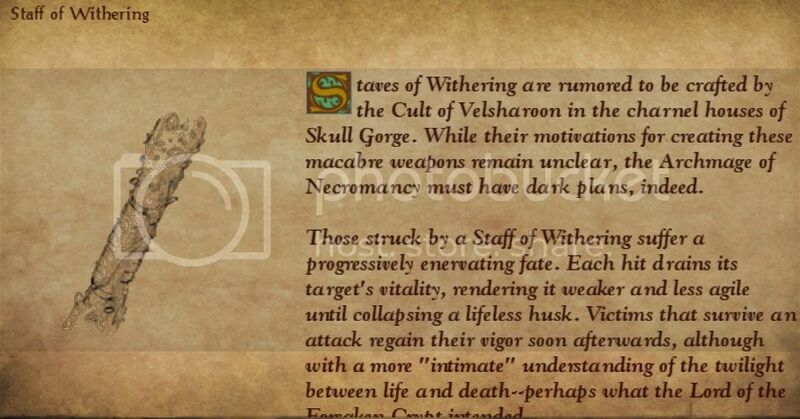 Staves of Withering are rumored to be crafted by the Cult of Velsharoon in the charnel houses of Skull Gorge. While their motivations for creating these macabre weapons remain unclear, the Archmage of Necromancy must have dark plans, indeed. Those struck by a Staff of Withering suffer a progressively enervating fate. Each hit drains its target's vitality, rendering it weaker and less agile until collapsing a lifeless husk. Victims that survive an attack regain their vigor soon afterwards, although with a more "intimate" understanding of the twilight between life and death--perhaps what the Lord of the Forsaken Crypt intended. Special: Drains the target's Strength, Dexterity, and Constitution scores by 1 point cumulatively upon each hit (no save). When any ability score reaches 0, the target dies. The target must also save vs. Wands with a -2 penalty or be slowed. The draining and slowing effects of the staff cannot be dispelled, but wear off after 3 turns for those who survive. Wielders of Staves of Withering (and their parties) do not gain experience points from deaths caused by its ability-draining effects. Experience is awarded only if the target is killed by by the staff's crushing damage. Candlekeep sages speculate the staves are enchanted to transfer the experience by some nefarious means to Velsharoon and his clergy. I found that the 1e version of the staff was limited to Clerics only, but the 2e version is usable by any class, so I decided to make it usable by Cleric, Druids, Mages, including all Specialist Wizards except for Illusionists (since the staff is empowered by necromantic magic). I can only imagine how OP the staff might become if it were usable by Kensai and Fighters. Since Clerics, Druids, and Mages/SWs have relatively weak THACOs at low and mid-levels, using the staff against difficult foes might be more of a liability (especially those with high ACs), given that it has only a +1 to hit bonus (which is non-magical--it was the only feasible way to restrict the staff from being used against outsiders and magical creatures). The PnP staff has charges, and therefore is expendable, but I decided to make it a permanent item (hence the price). I'd be interested in hearing what people's thoughts are on that as well. *The updated (v 1.5) item mod is attached below in RAR format. Thanks for @Alkalurops for making this mod WeiDU-compatible and @Cahir for the Polish translation. *Update 03/29/15: The save penalty vs. slow has been corrected to -2 (it was previously set at -4). What I haven't been able to figure out is how to get the item name and description to display in the character inventory as well as when it's in the quick item slot. Anyone have any suggestions for a newbie? These things are written into a file named dialog.tlk. DLTCEP normally expects this file to be in the same folder as the chitin.key file in your game directory. However, in case of BGEE which supports many languages, there are many dialog.tlk files spread throughout the lang folder. The English dialog.tlk is found in the en_US folder. Possibly the easiest way to get the text entries written into your dialog.tlk is to copy that file into the folder where chitin.key is located before editing with DLTCEP and then, after DLTCEP overwrites the file, copy the overwritten file back into the en_US folder. I have used the word file 7 times and the word folder 5 times, thus unintentionally rendering my helpful answer less helpful than I intended to, and more confusing than the matter in question really is. Apologies. I found that when an enemy dies to due ability score drain, it doesn't give the PC/party any XP. I decided to modify the effects so they they drain a percentage (20% per hit) of the target's STR, DEX, and CON scores, instead of draining 2 whole points every time. This lowers their scores to a minimum of 1, which wouldn't kill them of course, but it severely weakens them. That way, if they do die, it's from the actual blunt damage from the staff and not the effects of their ability score(s) reaching zero (which now awards the XP). Instead of making the staff available for purchase at a store, I think it would be much more interesting to have it in the hands of an enemy Necromancer and/or Cleric of Velsharoon (or even a Shadow Druid). That would certainly give the PC a memorable first-hand experience of the staff's power. It looks like I may not be able to set the staff to drain a percentage of the ability scores with every hit, afterall. DLTCEP allows cumulative modifiers for integers only (which causes the staff's victims to die due to reaching 0 in one of their ability scores). Anyone know if there's a way to get around this, such as adding a separate ability drain effect for each hit? To put it more specifically, is there a way to set a cumulative percentage modifier with non-permanent timing? I've finished the staff and am quite happy with the way it turned out. For my own game, I used DLTCEP to put it in the Ulcaster Dungeon under the pile of bodies (it seemed appropriate). I remember in BG2 there was a staff called Rod of Terror, which would drain slowly drain its wielders charisma when used. Once you hit 0, you would die, but this could be counteracted by wearing the Ring of Human Influence (Charisma set to 18). Your charisma would still drop if you took the ring off (and you would die if it was at 0 when you did so), but as long as you wore the ring you would not die to the charisma drain. If you gave the staff an additional effect, with say 20% chance of occurring, that would set the target's STR/DEX/CON to 9 (or whatever figure you prefer) for 4 turns, it would most likely proc before the target would die from stat loss and fix the EXP problem. Obviously some balancing and fiddling with the numbers is required, though. You should make an item pack mod. This looks like a very well made item that has some interesting tactical implications but is still fairly well balanced with equipment from the original game, and the description is well written too! @verybad Thanks for your suggestions and positive feedback! I remember the Rod of Terror, but I never used it since I knew it would drain my PC's precious Charisma score. I never thought about using the Ring of Human Influence to counteract the consequences of the draining, probably because I prefer to have both rings slots available for other rings. Still, that's a great tactic. Just to make sure I understand what you mean, are you saying that I should add an effect that would set the target's STR, DEX, and CON to 9 with a 20% probability in addition to the 1 point cumulative drains? If so, the problem I see with that is it could actually raise the target's scores and counteract the draining effects. Although boosting a target's scores to a fixed number would make them less likely to die from the ability scores drains (and, as you said, take care of the XP problem). As you probably read from my previous posts, I ended up modifying the description of the staff to accommodate the limitations I ran into while designing it. I think the possibility of not receiving XP for killing a target via the ability drain would cause most players to use the staff cautiously (e.g., at the beginning and middle of battles in order to weaken targets). While the limitation was unintentional, I think it adds an element of game balance to what could otherwise become an OP item. When used in a party, most opponents will probably die from damage by other characters anyway, given that the staff's causes only low damage. On the other hand, if someone really wanted to kill their target through ability drain, I think the quickest way would to first cast Ray of Enfeeblement on them (STR 5), followed by Contagion (-2 to STR, DEX, and CHA + slowed), which would render them dead in three hits by the staff, regardless of their HP. Since the XP from a drained kill is magically is transferred to Velsharoon and his clergy, I can imagine that this is the tactic they prefer when using these staves. I've attached a compressed folder with the files, including a readme, to my first post on this thread. It's my first mod, so I welcome any comments or suggestions you or anyone else may have. For anyone who might have downloaded this mod, I realized that two EFF files were missing in the RAR folder (which render the staff useless against undead). All of the files are now available in the RAR folder attached at the end of my first post. Apologies for any inconvenience. I've updated the staff description and added an additional ability to the staff: targets must save vs. Wand/Staff/Rod at -2 or be slowed for 3 turns. This is supposed to mimic the withering that the PnP Staff inflicts upon its victims when it makes contact with a limb. I've been using the staff in-game and haven't found it to be OP. Since it's usable only by Clerics, Druids, and Mages (excluding Illusionists) and that it cannot be used against undead or creatures immune to normal weapons, it's definitely not a game breaker. Thx for that mod, but i really don't understand the given instructions. Copying the files to the override folder shouldn't alter the dialog.tlk. Why do you want me to copy it to the lang folder then? (Also it doesn't make sense for my install, since I) it's allready there and not in the game folder and II) I have a hardlink to it there, to be weidu-compatible). @Graf_Wasili Thanks for the positive comments. I haven't updated this mod since the newest BGEE patch. The unpatched version of the game required copying the dialog.tlk file in the game folder, then pasting it into the language folder so the item description would show up in the game. Currently, I don't have the time to learn WeiDU, so unless someone else would like to do the honors, I probably won't be going over the tutorials and WeiDu-ifying it anytime soon. I didn't experience any issues with game updates (aside from having to repeat the copying and pasting process) and I'm not worried about the item code causing any problems, since it's unique. If you're worried about the description string causing problems with other strings, a short-term solution would be to just put the item file in your override without doing anything to the dialog.tlk. The description would be blank, but the staff would still work. Until this is done, the safest way to use this mod would be to do without the description and avoid putting the file ar3901.are in override and just use the console to get the staff. And... that didn't work either. Won't it also flat-out nullify any and all earlier alterations of dialog.tlk and therefore wreck pretty much all mods installed before it? Edit: Nevermind, didn't see the part about skipping the dialog.tlk override. Thanks for coming to the rescue, once again! ^.^ I'm planning on becoming WeiDU-proficienct during the winter holiday. I think my first test should be to see if I can successfully implement it in BG2EE. I think the file I had up was an older version, as I noticed that the save vs. slow effect had an incorrect (-4) modifier. I corrected to -2, as I intended in the item description. I've also added the slow effect icon so that it appears when a target is affected (in case anyone wants to test it out on a fellow party member). I've also updated the readme files and uploaded the RAR to my OP. Yep, I didn't realize that readme file should also be coded in UTF-8. I thought only ingame files matters. Well, I think it's ok to assume someone reading the Polish readme uses the Polish characterset, but still, I think it's better to be on the safe side and just use unicode. Thanks again to @Cahir and @Alkalurops. I've updated the readme and attached v1.5 with the Polish translation to the original post. Aaaaand I translated this mod as well. Nice description, I like it! Attached the Italian translation. Can you please add it to your mod? Great idea on this staff, always liked that one in PnP back in the day. I've been testing this more as of late with the Pale Master. The staff works SO nicely in concert with spells that lower stats like Ray of Enfeeblement. I might miss out on a little exp. sometimes but it is strangely satisfying. 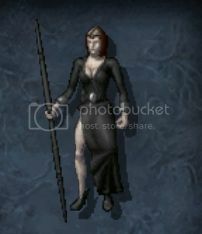 @Mortianna Is there any way you could add this nifty lil staff to BG2 somewhere? Fits so well with lost druids, necromancers and the pale master. I posted the Italian translation more than one year ago and it has not been included yet. Will it ever be?